Of all the inanities that diplomats utter at the time of an international crisis, the one that towers above them all is: Some foreign ministries expect China to restrain the Myanmarese junta. The Chinese have ignored many calls over Darfur; they sent the People’s Liberation Army to attack their own unarmed students at Tiananmen Square in 1989. Why would they care for Myanmarese monks? More disgraceful is India’s role, because more is legitimately expected of India, which never tires of reminding everyone that it is the world’s largest free-market democracy. If Indian leaders seem to have forgotten the concept of non-violent struggle, then they should see Richard Attenborough’s 1982 film Gandhi again. Replace the Indians making salt in Dandi and Dharasana with Mandalay’s saffron-robed monks; switch Gandhi in Yerawada with Aung San Suu Kyi under house arrest; and picture baton-wielding Myanmarese soldiers in place of British troops. That’s the scenario being played out in Myanmar. The test of India’s democratic credentials is now. Now an Indian government led by a political party that claims allegiance to Nehru has sent its energy minister, Murli Deora, to Myanmar to sign contracts to assure gas supplies for India, even as Myanmarese generals are cracking down on their own people who cannot bear the burden of yet another fuel price increase. There was a time when India knew better, and did better, too. In the 1980s, India allowed Free Burma Radio to operate from its soil—before realpolitik intervened. 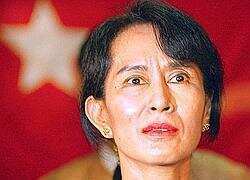 India honoured Aung San Suu Kyi with the Jawaharlal Nehru Award in 1993, two years after she won the Nobel Peace Prize. Realpolitik is certainly not exclusive to India or China. I remember, even Nelson Mandela, then president of South Africa, refusing to call for sanctions on Myanmar during an official visit to Singapore. When reminded at a press conference that it was his call for sanctions on South Africa that the world heeded, contributing to the end of apartheid, he said: “That was prisoner Mandela; this is President Mandela." Freed Mandela was a prisoner of realpolitik. Don’t depend on the strongest grouping to which Myanmar belongs to do something, either. Ten years of “constructive engagement" by the Association of Southeast Asian Nations (Asean) has brought us little. All those rounds of golf and dinner parties have given us peaceful monks with fractured skulls. And the world now expects China to do something. I remember Michael Ignatieff, now a Canadian politician but at that time the director of Harvard’s Carr Center for Human Rights Policy, speaking in London in the weeks leading up to the war in Iraq. Ignatieff supported the war (to his credit, he has severely criticized the way the war was fought, the erosion of civil liberties and the abysmal post-conflict administration of Iraq). He spelled out the dilemma international law posed in dealing with tyrants. He said waiting for the international community to do the right thing in Iraq would only mean many more might die. Turning suddenly to the Myanmarese example, he said: “Will we wait for Aung San Suu Kyi to die in jail and do nothing because the international community cannot agree on what it should do?" The ultimate tragedy of the Iraq war is exactly that: It has made future interventions—in Darfur, in Yangon—almost impossible.